These two films were a toss in the deep end of the pool for my sound editing career. Stephen Hunter Flick, who supervised both films through his sound house “Creative Cafe” had me as one of his staff editor /designers and being surrounded by titans of the film sound editing community, I have to say I was pretty much in awe most of the time. Since I am now writing this 13 years later, I guess it means I survived the ordeal… For my own benefit I will go through these chronologically starting with “Twister”. 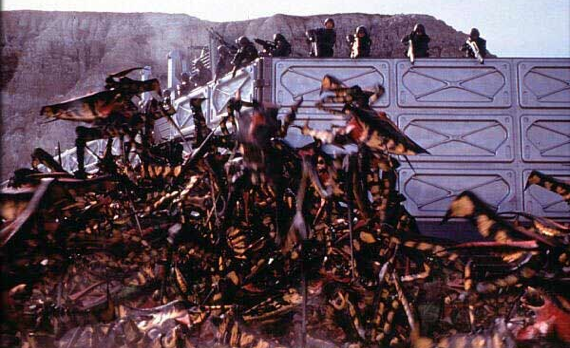 Twister and Starship Troopers actually started long before we saw the films hit proper sound post production. Both films had test that were provided by the film teams to see how things would work and be used to promote and otherwise cajole the studios to grant funds to make them. In the case of Twister, we did some trailer teasers which allowed us to investigate some ways to craft the signature tornado effects and develop creative concepts which we would take into the process. The design team for Twister was headed up by Steve’s longtime collaborator John P. the two of them earned their first Academy Award for best sound editing on the film Robocop, and continued to work together for some time following it. John is probably the most creative sound effects designer I have encountered and is just a wonderful person in general. The other early person who spent time on the show was Eric Potter and Ken Johnson, who did a ton of field recording for it. He recorded all the vehicles and tones of midwest ambiance’s and also developed old fashion wind machines and rigs to record wind as source for the films tornadoes. My original involvement on the show was designing some additional quad tornado sounds which allowed me to connect back with my friend from San Diego Martin Lope, who was into doing surround field recordings back then. 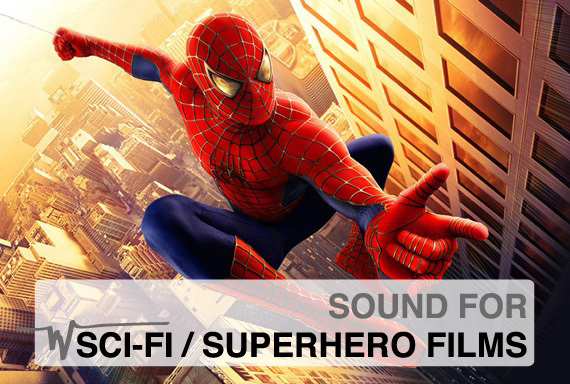 The sound effects editorial crew Stephen amassed for the film was also breathtaking. In no particular order, it consisted of Chuck Smith, Marvin Walowitz, Warren Hamilton, Bill Jacobs, Richard King, Greg Hedgepath, Teresa Eckton, Solange Schwalbe, Dave Spence, Chris Smith, Ben Wilkins, and myself. When Twister did turnover, the first seat I was given was as a foley editor. Since I was a total newcomer to that discipline Solange Schwalbe took me under her wing and taught me the art and technique. Learning feet was quite the experience….. so with that, I progressed cutting 4 reels of the film starting with props and and tornado foley, and moving to feet as the reels were completed. after that, Stephen shifted my attention to working on the tornado effects. John P had prepared a rich collection of sounds which Greg Hedgepath and I shared to create the Tornado predubs. The way we broke the work down was pretty simple. I did whatever Greg and Stephen suggested, so Greg did the animal effects sweeteners and I ended up crafting the wind fusillade. One thing that was sort of interesting is that the ProTools of 1996 was vastly different than what we are used to today. we had a staggering 16 tracks to work with… (John P actually did much of the design with a 4 track ProTools). Doing the winds for such a thing sa a tornado was pretty cool- though in my inexperience I ran into all sorts of road blocks in the process, either having relative few tracks or really small drives that we were working off of- (back then 4gb drives were pretty common- 9gbs were living pretty large….). As an expedient to the design process, Greg and I actually ran cables and timecode lines so we could run our systems in sync to see how our layers were working. Ah… such were the days! When developing the winds, I had the material John P had developed as well as library material I processed to sound as though it was going a million miles an hour and found refuge in Randy Thom’s axiom, “Distortion = Art” which Greg really made our catch phrase, so in treating the wind elements, I was routinely doing things like running two Waves’ L1 in Series and just crushing the signal into an insane mess of crunchiness. I don’t think I ever really anticipated the sort of sculpting we did (with Gregg Landaker mixing the my wind material, and Kevin O;Connell mixing Greg’s on the Music console, but it was fantastic fun developing it. The mix went for about 8 weeks as I recall, and as the film was being predubbed we were still cutting FX reels as well. It was a nutty show, and additional VFX came in almost daily which required conforms and updates. As I recall, there were actually printmaster sweeteners done due to update VFX… It went on to be quite a crowd pleaser, and certainly a great bit of work for Stephen, though Starship Troopers was lumbering towards our shop at a fairly fast pace. 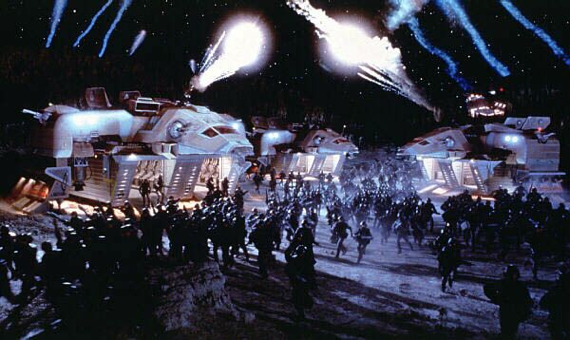 Paul Verhoeven’s Starship Troopers occupies an interesting space in the film world. It is allegory and comedy inside of a brutal war film. It always impressed me to talk to people about it, because everyone took a unique thing away from the film that was not obvious. The film itself pretty much had most of the same crew working on it with the notable additions of David Yewdall and Dave Stone (and Richard King left to do the remake of “the Jackal”) for this. I did not do any foley, and was really interested in doing the weapons sounds. For it, something I had never done on such a scale. I wasn’t able to really get into that until a little later in the process though, John P had been developing sounds for Starship Troopers over the 2 years or so leading up to our starting post on it. Stephen had a longtime relationship with Verhoeven and had been working on his films since Robocop, so they had been in communication about direction and other creative ideas which were of interest to Paul, Stephen had been preparing the the team over the year or so which preceded the film hitting us, but I still think none of us were prepared for its scale. We were just awestruck by the amount of sound that was to be required for it. Thankfully we had enough time, sort of to manage it, but it was a film of the sort we simply had not seen before. If you have not seen it, it is like taking the busiest parts of the Star Wars films and adding the most violent war footage from every war film you have seen and then adding a teen romance comedy into the middle of it- It was simply insane. So insane, that we exceeded 1000 tracks on 3 different reels as I recall, and that was with very tight and well prepared tracks from the editors. 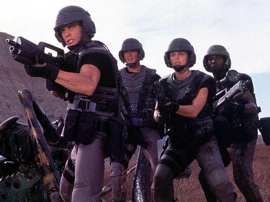 For me though, It was time to dig into the guns for Starship Troopers. Fairly early on, Steve had arranged for a Gunshoot that we shared with another film to have a nice gun library available for design. It was actually the first gunshoot I ever recorded at- (actually in 1997 I had not been out to record very much at all as far as effects recording went) and we had a deep team that headed out to the Peterson Ranch to record a bunch of live fire. The recording team consisted of Stephen, John Fasal, Patricio Libenson, Matt Beville, David Butler and myself. We actually had the latest DAT technology to record onto as well as Nagra analog machines, a NAGRA stereo deck that John had running at 15ips, a full track NAGRA Stephen had running a 7.5ips, 4 DAT decks, and a NAGRA 4 channel 20 bit recorder Patricio brought along. the shoot covered about 10 weapons and we got some nice material to start work with. Many folks love the sound of the analog Nagra;s for guns, and they can sound really great, especially in John Fasal’s or Ken Johnson’s hands, but I found that the good angles simply were not tied specifically to any one recorder. I remember actually being most impressed with a rig run by Dave Butler, which was an HHB DAT with a pair of Shure SM57’s they sounded outstanding on so many different guns. And since then they have been a must have setup for any gun recording s I have done since. So back at the Editing Rooms I started loading all the material and making masters to actually cut with. For this I did line up all the recordings into sync, and edited unwanted sound out- and with so many channels it was a task that took a few days, when nowadays it could have been finished in one… After that was all done- the masters went to David Butler, who was our librarian to be properly integrated into the library. I was then able to start working with the different recordings and building the Morita Rifles that were used by the Mobile Infantry of Starship Troopers. The sound of these rifles was based on the iconic sounding M60 beltfed machine gun- the problem however was the rate of fire was entirely faster than what the M60 did- to handsync all of them would be impossible given the amount of time I had so I had to figure out a way to make the sound I wanted elegantly. I first experimented with a few things, and even used an esoteric feature in the old music program StudioVision to build a mechanical layer to the weapons. This was accomplished by taking the gun recording and having SV create a midi track from the gunfire transients, it actually worked to an acceptable degree and it allowed me to create a mechanical layer on my Emulator III that would be insync with the gunfire. Once the sound was finalized, I created a pre-master of the gun and set about the next task of speed adjustment. Revisiting Studiovision and Recycle to use MIDI slices to reclock was not working well, so I then looked at the software application Vocalign, by Synchro Arts. Typically the program is used for dialog, so I was curious as to how it would work for the guns. O proceeded by creating a varispeed version of the guns to match the firing cadence, and used that as the guide track, with the normal pitch guns being the dub track, in the end, VA did work as advertised with little artifact and it allowed me to cut the millions of gunshots in an elegant fashion..
Hey, I know Solange…. Great addition to your series. I love the Tornado Wind 1 track. Keep up the great work. Charles! Thank you for another great article! I find your stories to be enormously insightful and enjoyable. The audio examples illustrate perfectly what you discuss. You’ve raised the bar for feature stories on this or any other site. Keep up the good work, and thanks for sharing! I’ll second what Tim says. Thanks for sharing, Charles. A really fascinating read. I absolutely love both Twister and Starship Troopers, thank you for sharing this. 1000 tracks! That gives me a headache just thinking about it. 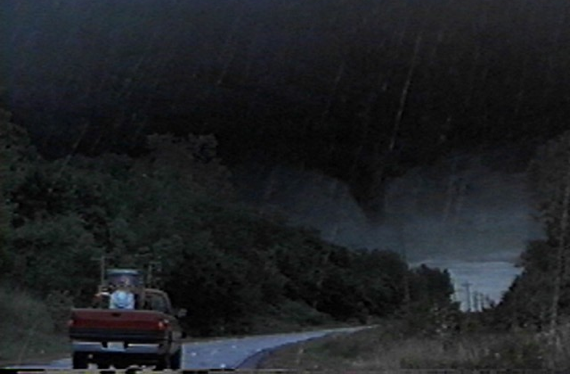 Hi Soundeffects guy- usually it is not something you want- all the time, but as Randy Thom once said- “Distortion = Art” in the case of Twister it was a convenient wy to imbue the sense of scale the winds of an F5 category Tornado was supposed to have. OMG THE MORITA FIRING SOUND FROM THE CREATOR HIMSELF! Did you perchance also create the shotgun sound and still have it? I tried getting it from the movie itself but there’s so much bug noises in the background that ruin it. I need this for a Starship Troopers video game mod project. drop me a note at charlesbmaynes@(gmail.com) and I will see what I can do for you….